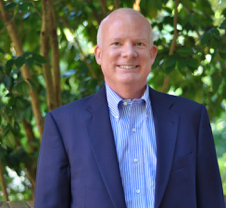 A retired professor of the practice of law at William & Mary Law School, Bill practiced tax law for almost 28 years before he retired in 2008 and started his teaching career. He majored in philosophy at William & Mary, where he was a member of Pi Kappa Alpha and received his J.D. from the University of California, Hastings College of the Law. After law school, Bill clerked at the Supreme Court of Virginia and then joined the law firm of Hunton & Williams in Richmond. A past chair of the Corporate Tax Committee of the ABA’s Section of Taxation, he is a fellow of the American College of Tax Counsel and a member of the William & Mary Tax Conference’s Advisory Council. Bill co-chaired the Class of 1974’s 30th and 35th reunion gift committees and served on the Fund for William & Mary’s Board of Directors from 2004-09. Most important, Bill is married to Mary Bobbitt Richardson ’74. Long-time members of the President’s Society, they have two adult daughters and two young grandchildren. Neither daughter attended the College, but Bill and Mary are hoping at least one grandchild will.